Habit: Shrub 2--6 m, evergreen; twigs spreading, rigid. Leaf: 1--3 cm, stiff; petiole 2--5 mm; blade elliptic to round-ovate, adaxially glabrous to sparsely puberulent, +- shiny, olive-green, abaxially densely glandular-puberulent when young, glabrous, pale gray-green in age, tip generally spine-toothed, margin wavy, strongly spine-toothed. Fruit: cup 10--25 mm wide, 6--12 mm deep, generally bowl-shaped, rim +- spreading, scales not tubercled, densely hairy; nut 20--30 mm, +- ovoid, distally obtuse to +- rounded, shell densely woolly inside; mature in year 2. Ecology: Uncommon. Rocky slopes, flats; Elevation: 300--1600 m. Bioregional Distribution: e NCoRI (Colusa Co.), s SNH (e slope), nw SnJV (Alameda, Contra Costa cos.), SnFrB (Alameda Co.), SCoR, WTR, SnGb (n slope), SnBr (n slope), e PR, s edge DMoj, DMtns (Little San Bernardino Mtns); Distribution Outside California: Arizona, Baja California. Flowering Time: Apr--May Note: Hybridizes with Quercus chrysolepis. Synonyms: Quercus dunnii Kellogg, illeg. 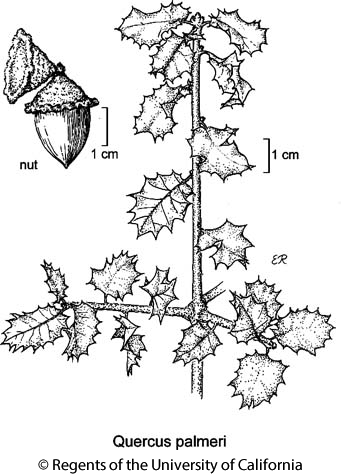 Citation for this treatment: Thomas J. Rosatti & John M. Tucker 2014, Quercus palmeri, in Jepson Flora Project (eds.) Jepson eFlora, Revision 2, http://ucjeps.berkeley.edu/eflora/eflora_display.php?tid=40584, accessed on April 25, 2019.
e NCoRI (Colusa Co.), s SNH (e slope), nw SnJV (Alameda, Contra Costa cos.), SnFrB (Alameda Co.), SCoR, WTR, SnGb (n slope), SnBr (n slope), e PR, s edge DMoj, DMtns (Little San Bernardino Mtns); Markers link to CCH specimen records. Yellow markers indicate records that may provide evidence for eFlora range revision or may have georeferencing or identification issues. Purple markers indicate specimens collected from a garden, greenhouse, or other non-wild location.